Select the Process latest full backup chain only check box if you want to copy only the last backup chain with each tape job run. The source backup chain consists of a full backup (active or synthetic) and subsequent increments. If you disable this option, the tape job will back up all restore points that are not on tape. Disable the Use hardware compression when available check box. Select the Run the following script before the job and/or Run the following script after the job check boxes and click Browse to choose executable file(s). You can select to execute pre- and post-job actions after a number of job sessions or on specific week days. After you specify necessary settings for the tape job, you can save them as default settings. To do this, click Save as Default at the bottom left corner of the Advanced Settings window. 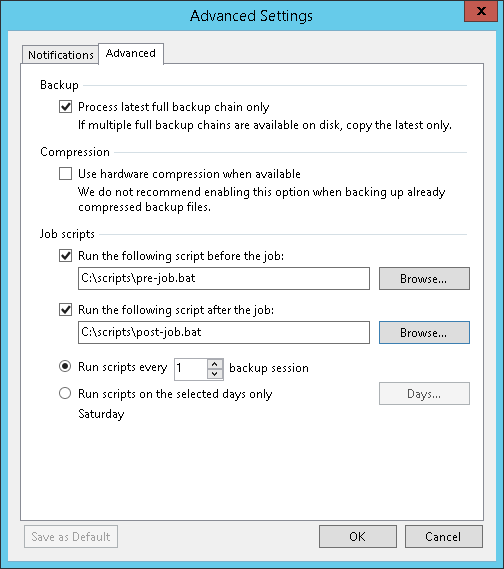 When you create a new backup to tape job, Veeam Backup & Replication will automatically apply the default settings to the new job.